"It would have been tough otherwise [without leading off the line]" said Lewis later, "but honestly my pace was really good so maybe I'd have been a little bit close..."
It appeared proof too, as if we needed it, that Lewis has no intention of meekly cruising to his third title. It's not his way for one thing, but also a second place to Nico today would have resulted in a 34 point lead for him. Still comfortable enough but rather down on his 53 point lead just two rounds ago, and accompanied no doubt by a creeping sense of momentum for Nico. 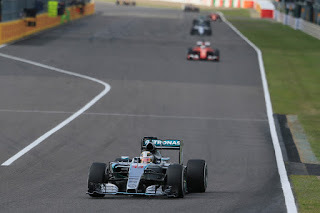 Toto Wolff claimed later that there was nothing to see as Lewis had merely understeered on cold tyres. Perhaps. Lewis later gave the game away though. "At the start I was a little bit hesitant initially" he said, "I got a good second part, which obviously got me alongside. And then after that the outside line is the best line into turn one, and Nico was on that, then after that fortunately I was on the inside, so I really had to give it some power and make its stick, and once I got my wheel ahead I started running out of road, but he [Nico] had to back off. So I'm super super proud of myself because as a racer you know you have to make that stick and if I hadn't I'd be kicking myself right now. "When you're on the outside you have to expect that...It's tough for sure, but this is not a friendly game of chess, this is do or die". Rosberg seemed peeved though. "I've not seen it on TV, but it was close" he said. "I had to avoid a collision, but it's difficult to comment. The car is really back to its best - it was a pity to lose out at the start. It was a battle round turn one and two, and it got very close on the exit of turn two so I had to back out of it and that lost me the race." He also was well aware of what it all meant for the championship. "That's going the wrong way, definitely. I had to win today, it was important and it didn't work out. Just need to try and win next time out". Lewis won in the end by a balmy 19 seconds and with something of a flourish set a fastest lap a second quicker than his team mate. The TV director appeared to agree that first place was long since taped up as from the world feed you'd hardly have known Lewis was out there. Or for that matter that Nico was out there either. Perhaps the said director had someone order him not to show the Mercs. Because that someone was pushing for Merc to provide Red Bull with engines and wanted to punish it for not doing so. Or something. Not that this sort of thing has happened before of course. Nevertheless the 25 points are all the same and Lewis's third title prospects crept yet further into the virtual certainty category. 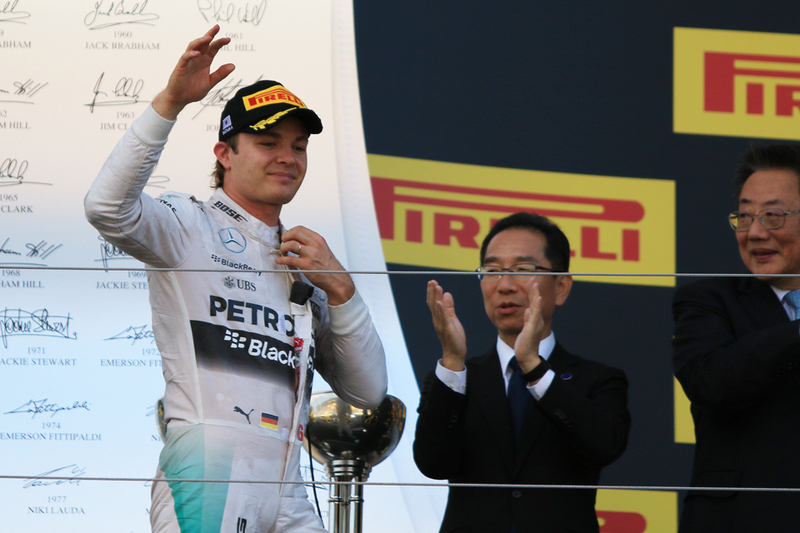 Rosberg did manage to salvage second, and in another timely bounce back for Mercedes both of his position gains owed to smart strategy, another area that some had been critical of the team. 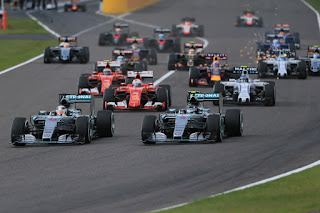 Valtteri Bottas was cleared when Merc refused to twitch when Williams pitted the Finn early, and having stopped at a more standard time Nico quickly ambushed him at the chicane on fresher tyres. Then in the second and final round of stops Sebastian Vettel was undercut smartly. At that point Merc's perfect day was complete. Vettel as we've come to expect this campaign pedalled as hard as he could to keep the haughty silver cars honest, and indeed was still within two seconds of Rosberg at the end. Despite this though the talk of his title long shot post Singapore now seems as good as gone. 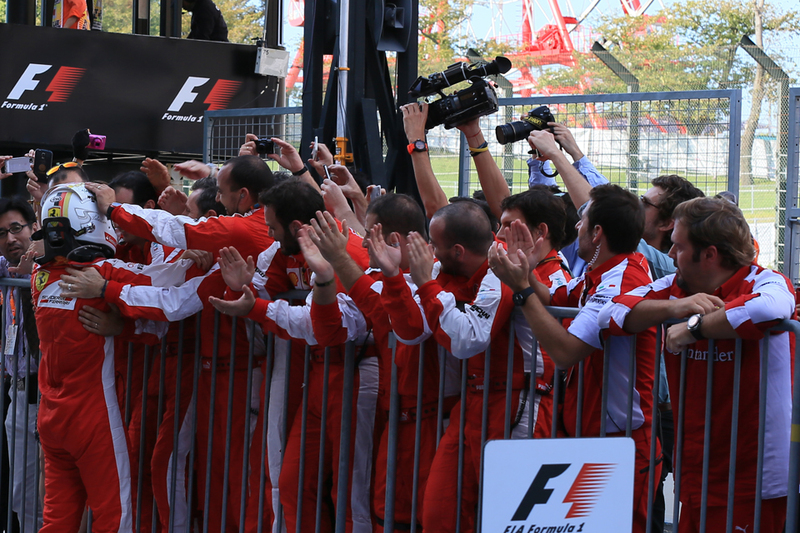 Vettel also rued getting caught on the strategy hop. "Had we pitted one lap sooner I think it could have been more interesting and challenging for Nico to get past" Seb noted afterwards. "It's not so easy to follow the cars here through the high-speed sections, so I think we had a good chance but, yeah, probably underestimated the out-lap that he had". He added though that "with hindsight, it's always easy..."
The Williams pace of yesterday evaporated curiously. 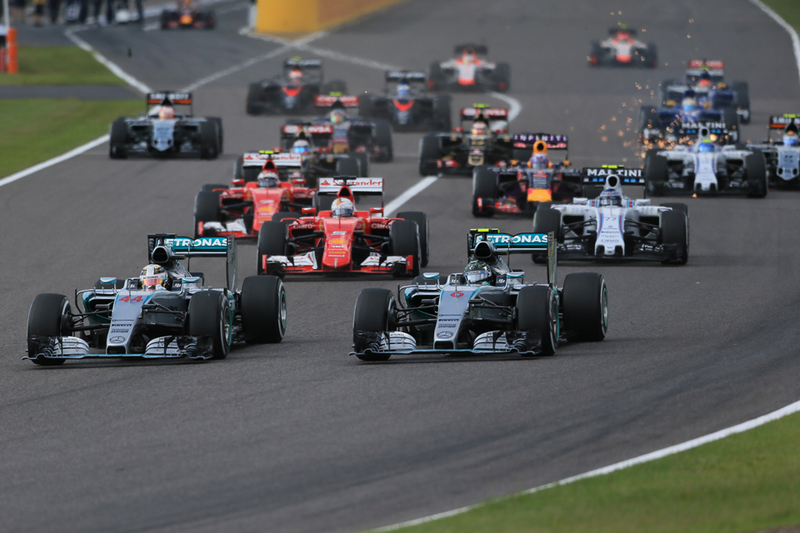 From being a comfortable best of the rest then Bottas sank to a fifth place finish some 16 seconds after Vettel. 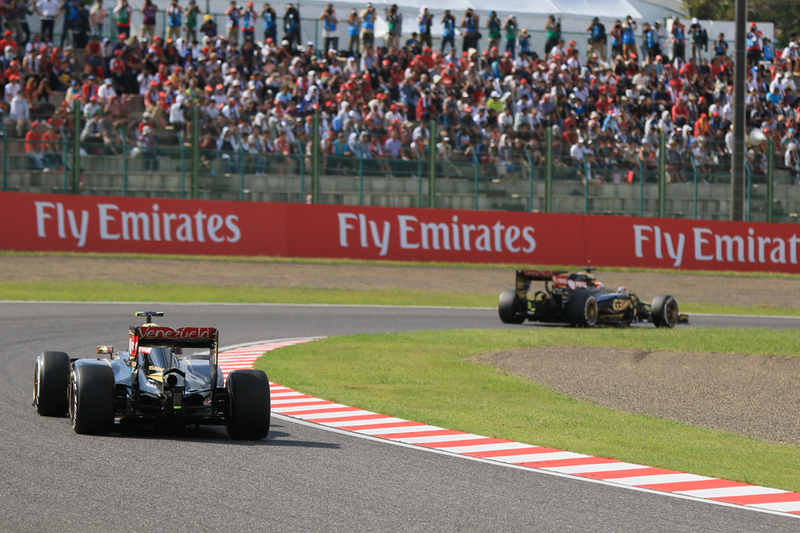 The other Ferrari of Kimi Raikkonen managed to undercut him at the second stops to get ahead too. Felipe Massa's day was ruined when he got together with Daniel Ricciardo in the run to turn one, giving them both punctures. Both finished well out of the points as a consequence. Sergio Perez was similarly compromised when he was on the end of a chain reaction started by his team mate Nico Hulkenberg trying a move down the inside more associated with a child controlling the car via a PlayStation. It's one way of dealing with an on form stable mate I suppose. The Hulk motored on to finish sixth, managing to be another to benefit from an undercut in his case of the Lotuses at the first stops. 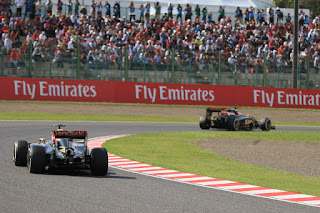 But in a weekend wherein Lotus financial woe found a new depth - with the team not allowed to use its hospitality unit at the track due to not paying the rental fee - this time its drivers gave the team something to smile about as both got into the points, Romain Grosjean seventh and Pastor Maldonado just 1.2 seconds shy in eighth. We can talk all we like about the Lotus qualifying match-up but Pastor is often much more potent in the race as he has a strong ability to get life out of the tyres over a race stint. More broadly one can only hope that the drawn out Renault-Lotus deal is done by tomorrow. The consequences of it not being don't bear thinking about. 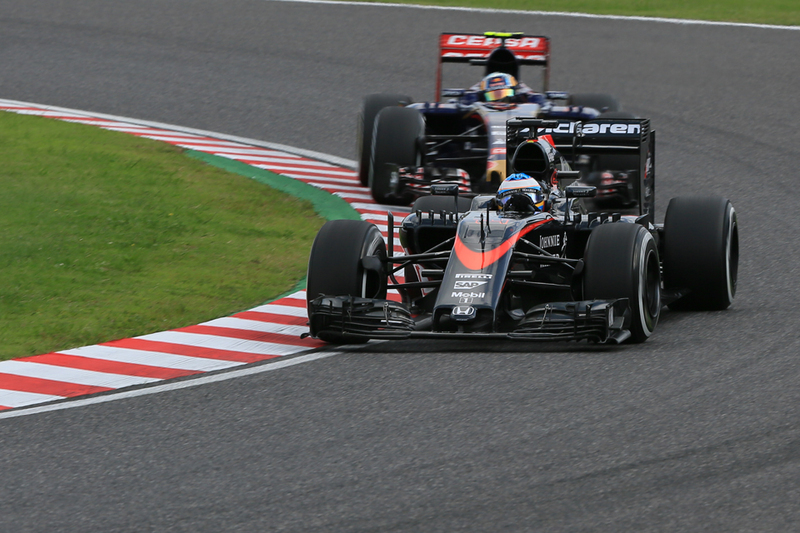 The points places were completed by the Toro Rossos, both of which had adversity to overcome. Max Verstappen got ninth after starting down in 17th while Carlos Sainz had a 19 second pit stop thanks to clouting a bollard on the way in, necessitating a front wing change. Next up was Fernando Alonso, who somehow hauled his McLaren into P11, and a fairly comfortable one, and on a day that only one driver (and one that was behind him) dropped out. 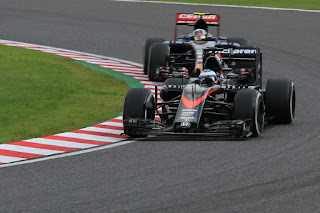 Indeed he finished 25 seconds and five places ahead of his very good team mate Jenson Button. Not that this is what people are talking about. Instead it's what Nando had to say on the team radio during the race, namely that his lack of straightline speed was "very embarrassing" and that he more than once likened his Honda to a GP2 engine. Personally I think it's a fuss over not very much, and oddly such a fuss didn't happen in response to Button's piercing criticisms of the team yesterday as well as in Singapore. It's almost as if reputations go before them. And that some are rather determined to assume, and have been all along, that Alonso's relationship with the McLaren team is bound to implode. The prissy response is as sadly predictable as it is histrionic. And if this weekend should have taught us anything, it's that the excited accompanying chatter of this game is not the place necessarily to find wisdom. Mercedes under threat? Behave yourself.